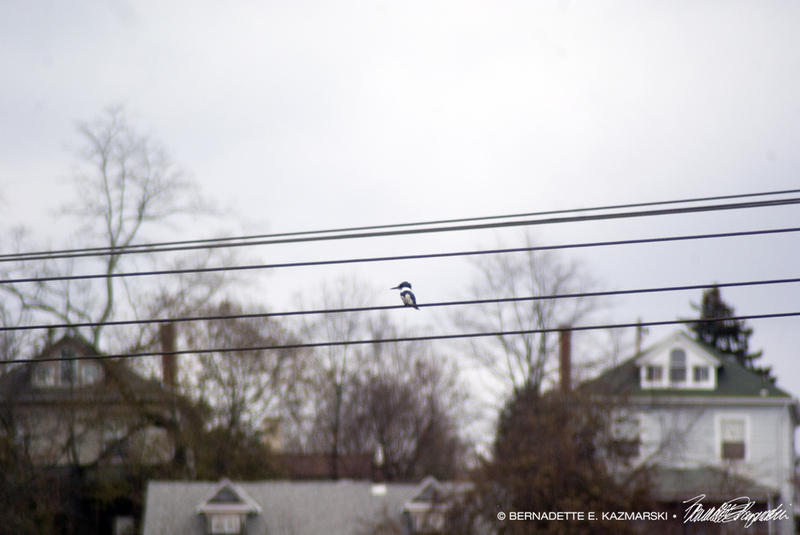 Kingfisher on the power lines. The other day as I walked into Carnegie I saw the flock of Canada geese congregated along the creek and a small tributary in the center of town, doing goose things. At the same time I heard a familiar chittering and finally found the tiny shape of a kingfisher on the power lines above the creek, loudly scolding the geese and likely telling them to get out of his territory. They paid no attention, but the kingfisher did not relent. and those certain to be. but for ourselves as well. but you tell us to be ready for new accomplishments and adventures. 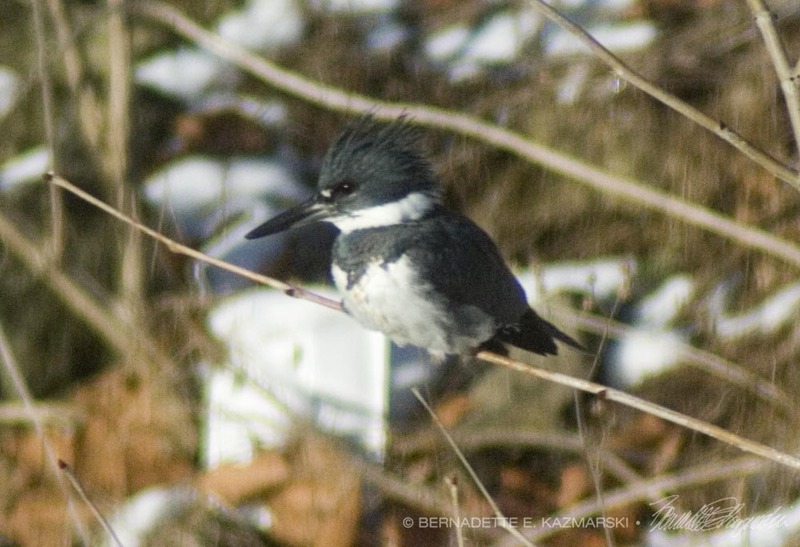 Kingfishers are not large birds, barely larger than a robin but with a stubby tail and an almost top-heavy head, very protective of its territory along a waterway. They are small but bold, and are also known to be a harbinger of the health of a stream because they needs to feed directly from creatures that live in the water and will leave if there isn’t enough to eat. Once Chartiers Creek was so polluted even plants died on its banks, but after decades of a ban on dumping and a mandate for cleanup the waters were safe to be in, to fish in and fish and other aquatic species began to return. I had been hearing a kingfisher’s chittering along the creek for a couple of years but the actual bird was hard to spot. Finally one March afternoon I saw the actual bird and photographed it diving into the water. We had reversed a century of pollution. 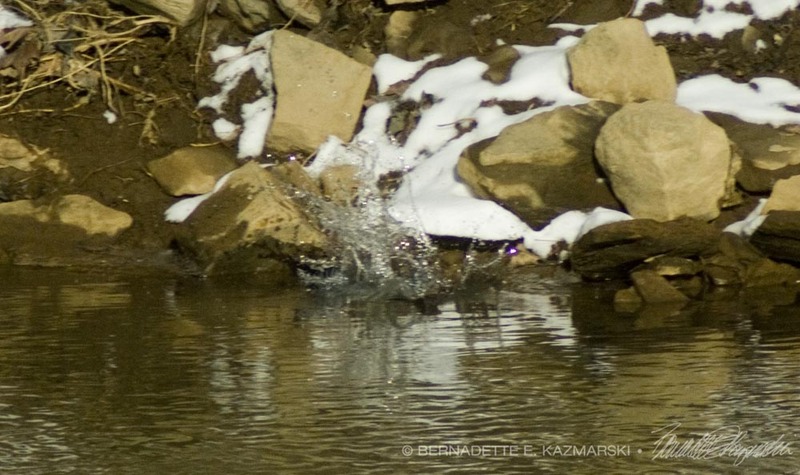 The kingfisher splashes into the creek. 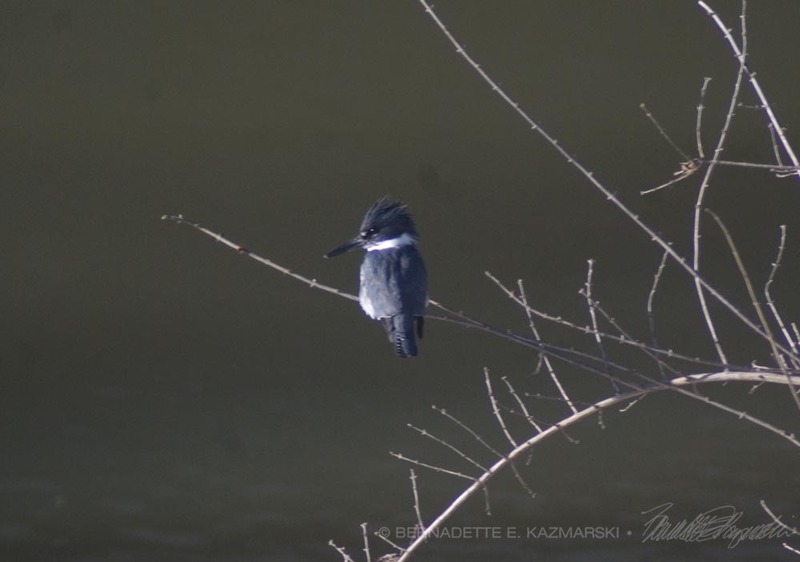 I saw the kingfisher two days before my 2014 poetry reading celebrating the 110th year of Carnegie’s existence, and wrote the poem then and read it at my reading. Kingfishers also symbolize adventure and future accomplishments and tell you to be bold, so perhaps we’ve not only healed past ills, but also it may mean the best is yet to come.